It was a chance meeting that led Dr Loh Xian Jun to make progress on a biomaterials project he was working on. He developed a new drug-delivery system but was trying to figure out which drug would be best suited for his project. The answer came unexpectedly at a symposium last year, when he was introduced to experts at the Singapore Immunology Network, which led to a joint project on the delivery of a dengue vaccine. "You need a lot of collaboration in the area of biological experiments. The project is still ongoing and it shows how important this accidental spontaneous discussion is, as it can actually lead to new leads," said Dr Loh, a senior scientist at the Institute of Materials Research and Engineering (Imre). This spontaneous collaboration is what the chairman of the Agency for Science, Technology and Research, Mr Lim Chuan Poh, is hoping for with the opening of the new Fusionopolis Two building yesterday. The latest $450 million addition to the research and development hub at Buona Vista is made up of three new towers - named Synthesis, Innovis and Kinesis - which will house four A*Star research institutes. They are Imre, the Data Storage Institute, the Institute of Microelectronics and the Singapore Institute of Manufacturing Technology. 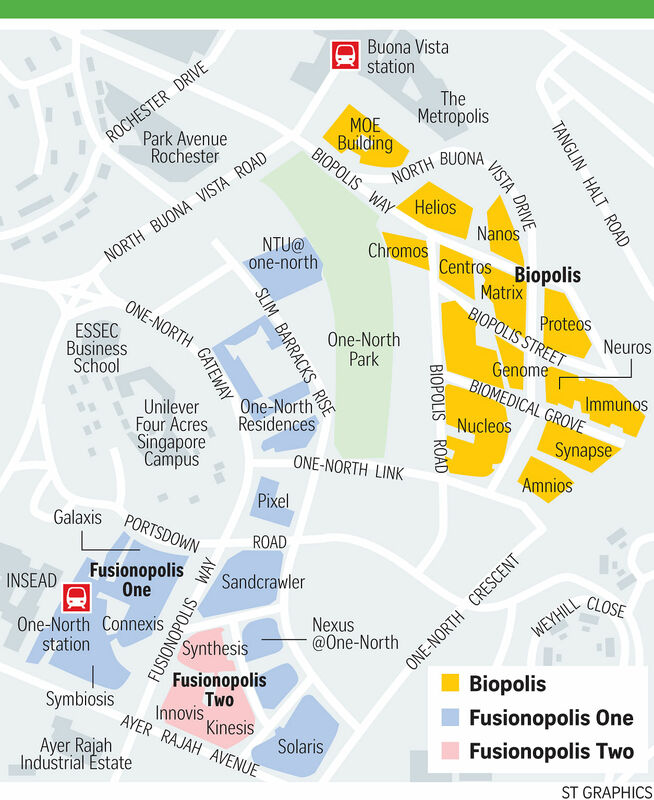 With the new building, 16 of A*Star's 18 science and engineering research institutes will be housed in one location in both the Fusionopolis and the nearby Biopolis campuses at one-north, a vision which has been 14 years in the making. More than 35,000 people currently work in one-north, in 250 companies, research institutes, global and corporate universities, and public agencies. The move to house its major talent in one area is a necessity, given that Singapore has limited land resources, said Mr Lim. But it will also create new ways for scientists to collaborate and develop solutions that would not otherwise be possible. By being close to one another, scientists of different disciplines will "collide" or discuss their projects, which could then yield new possibilities. "The more we create and facilitate their ability to collide, the more we will see their ideas come together and fuse and open up new spaces for discovery and for innovation," said Mr Lim. "The constraint of Singapore, our physical smallness that obliged us to intensify the co-location of people, has turned out to be a huge advantage when it comes to research and innovation." A*Star's efforts have also paid off for the economy, said Mr Lim. From April 2011 to June 2015, A*Star undertook about 7,500 industry projects which sparked off more than $1.13 billion in industry R&D investments in Singapore. Mr Lim was also bullish on the prospects of the industry. There are many other areas of growth for the R&D industry here, including cell therapy, data systems, advanced manufacturing and "how deep understanding of biology is going to shape engineering". The possibilities "are just infinite", said Mr Lim. JTC, the developer of one-north, said Fusionopolis Two will strengthen the R&D hub's position as a destination for research, innovation and enterprise. It will "generate more knowledge-based and value-creating jobs for Singaporeans in the future", said JTC chief executive officer Png Cheong Boon, .